Pay attention to Rich and Famous men and you'll find that they favor mens french cuff dress shirts when they are dressed up. French cuff dress shirts are all about style in a way that an ordinary dress shirts seems to lack. There is just something special about those fold up cuffs with the cuff links that add just what is needed. 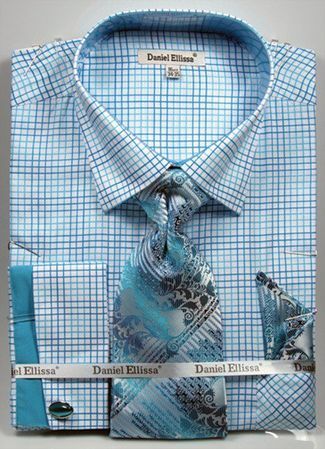 This turquoise blue graph style plaid french cuff dress shirt comes with the fancy tie and hanky set and are made of cotton/poly.